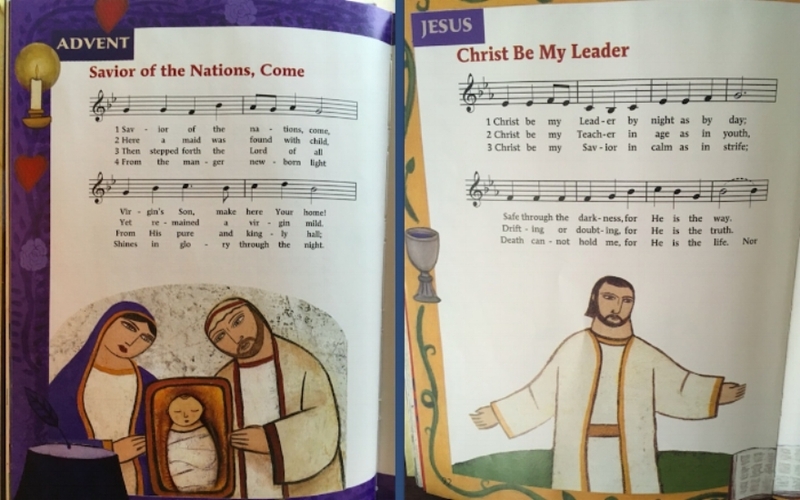 I love this children's hymnal that CPH published a few years ago. It puts historic texts and serious music in front of kids in an accessible way. And it teaches them not to be afraid, like many churches are, of "old" songs, basic musical notation, and the importance of singing. Hymnals are great, and our churches should be using them. Jonathan Aigner has written so well and so thoroughly on this subject that I hardly need to add anything. But this is important and I'd like to reiterate some of his points in my own words. The worst argument against using hymnals is "no one reads music." The reason they don't read music is because you took the hymnals away. The hymnal is the primary tool for teaching a congregation how to follow musical notation. I'm not talking about getting a music theory degree, just picking up on the most basic principles of note-reading. It's amazing what you can accidentally learn from simply following along in the hymnal while everyone sings. When my daughter was 3, she already knew that "white notes are slow and black notes are fast," and that "when the notes go up, you sing higher." Most melodies in the hymnal are simple and predictable, and you can often guess the right note based on the direction of the line. Churches without hymnals often use CCM-style praise songs instead, with a worship band and the lyrics on a screen. This genre is sometimes criticized for its simplicity, but most songs in this style are actually much harder to sing than traditional hymns. The music is rarely printed, so you can't sing the song until you've learned it by rote. The melodies are often rhythmically syncopated, and set in an uncomfortably high register for most male voices. Add a lead singer who is amplified louder than everyone else and adding their own personal style to the vocal delivery, and it's almost impossible for a large congregation of untrained amateurs to participate well. Chorale-style hymns, on the other hand, are composed specifically to facilitate congregational singing for non-musicians. The melodies are simple and the music is printed right above the words, which helps us pay attention to the meaningful ways that hymnwriters marry text and music together. The best hymns, the ones that have been tested over centuries and fill our hymnals, convey theological, poetic and musical depth without being difficult to sing. Amateur voices won't sing well together unless the music fits their ability level. When it doesn't, congregational singing goes away and church becomes a concert. Hymnals encourage the congregation's voice, as Aigner says, to be "the primary instrument in corporate worship." -Every singer is responsible for the time, just like the drummer and bassist. -Jazz requires a conversational lyric delivery. Sing the words the way you would say them. Emphasize the most important syllables in a natural, speech-like way. -You have to love the sound of the most dissonant interval in the chord. -If you learned the notes wrong, being stylish doesn't matter. -If you aren't singing in tune, nothing else you're doing is cool. -You're in tune, but the vowels don't match. -You got too loud too soon and too often. -When you got quiet, you got wimpy. -Try singing this ballad without the conductor. -Rubato means wait longer between phrases. I shouldn't be able to tap the tempo along with you. -Improvising soloists, you're too worried about note choice and not worried enough about time, rhythm, and compelling horizontal ideas. -When you're improvising through multiple sections of the form, blur the seams. Don't stop in the last bar of section 1 and then start a new idea as section 2 begins. -Find a way to show the groove physically, it helps us trust you (i.e. SNAP). -This song needed one soloist, not four. Pick the best singer for the chart, then let them tell the whole story and develop their ideas. -That little bit of organized movement wasn't necessary. -That full-on choreography wasn't necessary. -Don't overact or put on hyper-smiley personas. Let the music do the work. -I probably wouldn't give this lyric to a middle school group (etc.). -Your vowels are too tall (save it for concert choir). -You're over-enunciating consonants (save it for concert choir). -Neutral syllables are not text. Just use them to make the lines feel instrumental. -These charts are too hard for this group. -These charts are too easy for this group. -Piano alone is not enough for this music. Beg/borrow/steal to get a rhythm section behind these singers. Composers, there's a great lesson here about the craft of concision. In the same way that overwriting and surface complexity can cover up a lack of interesting musical ideas, if your raw material isn't compelling, you can just wear out the listener with length. 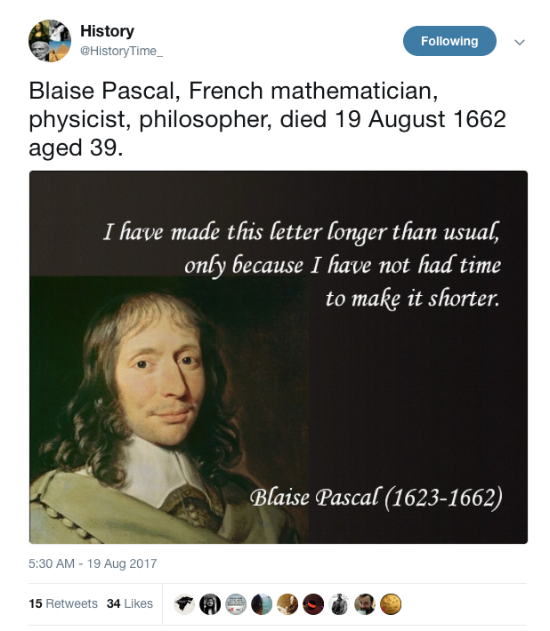 Long pieces are not automatically good. Rambling is easy. Economy is hard.